There's one good choice, and it's made by Suitable Technologies. After spending 20 hours researching telepresence robots and testing two of the most promising models in office and home settings, we don't think these devices are ready for prime time. But if you want a telepresence robot to give remote employees a physical presence in your office, the Suitable Technologies Beam Enhanced is the only bot that's reliable and user-friendly enough to consider. 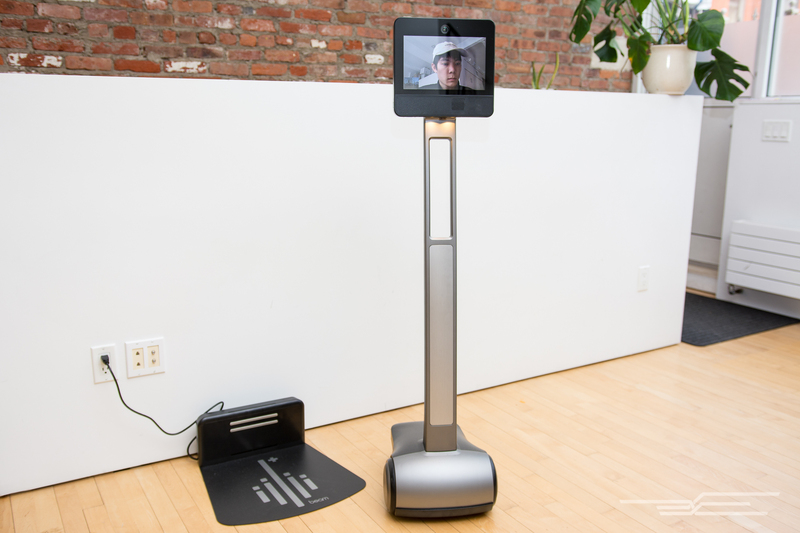 A telepresence robot is a videoconferencing screen mounted on a moving base. You can log in to a telepresence robot and control it, projecting your own face on the screen while you move around and interact with people. Using one allows you to navigate the environment at a limited speed, but you can't do much else—no hands on a telepresence robot means no button-pushing or door-opening, for example. At this time, given these limitations and factoring in the devices' multi-thousand-dollar price tags, it's difficult to justify a telepresence robot as anything but a novelty. But even novelties can be useful in certain contexts and environments. For example, remote workers who want to establish a physical presence in an office or students with chronic illnesses who are unable to attend school in person might find telepresence robots useful. You might think that between Segway scooters, high-tech tablets, and compact Bluetooth speakers, companies have the technology to make a decent telepresence robot at an affordable price. But if you do have such expectations, you should lower them. After poring through the spec sheets of every model currently available, we came up with some common criteria that make for an acceptable bot. Video quality is of primary importance. Having a field of view wider than 90 degrees is preferable, as it lets you see more of your environment and more easily navigate around objects. Cameras should be high-resolution, too, even though many of these bots don't even crack 720p. Bots that produce higher-contrast images are also more useful. You should also be able to hear your colleagues clearly, and be heard. Look for models that have multiple speakers as well as as multiple microphones. The screens should ideally be at least 720p resolution to clearly display the operator's face. Screen size does matter, but only up to a point. If a telepresence robot is supposed to represent a remote worker, its battery should be able to last an entire eight-hour day if need be, and you should be able to recharge it yourself via a charging dock. A solid network connection is important to control a telepresence robot, so dual-band Wi-Fi support (for both the 2.4 GHz and 5 GHz bands) is critical in maintaining a connection through any potential network soft spots. A regular operating speed of at least 1 mph is necessary to keep up with anybody walking with the bot. That's a pretty leisurely pace, so a 2 mph boost mode is also good to look out for. No wireless connection is perfect, so in a worst-case scenario, a good telepresence robot needs to be easy to carry, or at least push. Finally, we wanted something that you could actually buy, meaning, as affordable as possible. Unfortunately, many of these robots are designed and marketed solely for corporate or academic environments, which makes them prohibitively expensive, difficult to purchase, or both. In the end, finding a telepresence robot matching all these criteria—especially at a reasonable price—was impossible for us. However, the Double Robotics Double 2 and the Suitable Technologies Beam Enhanced both met a majority of our criteria, so we called them in to put them through their paces. We conducted our first test at the offices of The New York Times (parent company of The Wirecutter and The Sweethome), but security issues with the building's Wi-Fi network kept us from connecting to the Beam, so we also tested in our test-kitchen apartment. If you are set on buying a telepresence robot, the Suitable Technologies Beam Enhanced is the only one that's currently worth considering. It displays and captures clear video feeds, maneuvers more responsively than the competition, and has the easiest setup process of the telepresence robots we tested. And the professional administration software makes it easy to manage in a corporate environment or a home setting. The Beam's built-in 104-degree wide-angle camera produced a clear image of our office that looked much brighter and more detailed than the images from both the iPad Air 2's front-facing camera and the Double 2's own camera add-on, despite providing only VGA resolution (640×480 pixels). Your co-workers will look pretty grainy on a Retina display, but the Beam offers great contrast in a variety of settings thanks to superior low-light performance and HDR support that helps you make out even heavily backlit faces and obstacles. On the other side of the conversation, your call recipient will see your face clearly on a brightly backlit 10-inch, 4:3-aspect-ratio screen that's much more easily visible under bright light than a typical iPad screen. The robot's downward-facing camera, aided by a pair of LEDs, also gives you a clear view of what's in its path and includes a handy arrow overlay that shows where you're headed. It overlays a virtual projection that's as wide as the bot, so you know exactly if it will fit or not. The display offers live updates based on your control inputs and is a great visual aid if you're new to operating a telepresence robot. Usually we call this section of a guide "Flaws but not dealbreakers," but in this case the flaws inherent to current telepresence technology might actually discourage many people who would consider buying into it. In the case of the Beam, you get fewer drawbacks than you would with other options, but it's still far from ideal. Telepresence robots, including the Beam, are prohibitively expensive for what they do. For the cost of one, you could buy a videoconferencing system for the office instead. The Beam model we tested costs nearly $4,000, and to use it you have to pay an annual subscription fee of nearly $400. Furthermore, telepresence robots can't exactly navigate an entire office building without help, and neither the Beam nor the Double is suited for multistory operation. Neither telepresence robot features object avoidance, and someone will need to carry it up the stairs or hit an elevator button for the remote co-worker. As for Beam-specific issues, setup is easy—but only if it's even possible in the first place. Connecting your telepresence robot to a network is easier said than done if you don't have admin access to your office's network—or at the very least, a cooperative IT department.